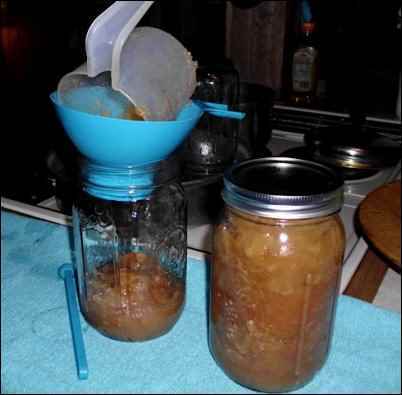 How to Make Homemade Applesauce: Accept No Substitutes! Home /Food, Frugality and Finance, Fruits/Homemade Applesauce: Accept No Substitutes! My husband Donnie was raised near the Brushy Mountains of North Carolina, a little set of scenic, high hills in the central part of the state. His grandfather had an apple orchard there, where Donnie worked when he was young. His granddad naturally never shared good apples with the family; he was a serious businessman and those were his livelihood. Donnie says he never ate an unflawed apple until he was old enough to buy apples for himself. 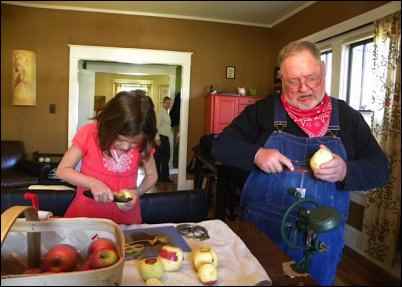 The years sorting, hauling and selling apples gave Donnie a special love of apple varieties and flavors. When I met him, I guess I considered a store-bought Golden Delicious to be the height of the apple experience. Now I eat applesauce for supper every night, and the names of the apples that comprise it are exotic to my ears. Friends and even strangers who have tried our applesauce marvel that it contains no added sugar, no cinnamon, nothing but The Apple. I recall an orchardist from upstate New York we met at a party swearing we must have put sugar in the apples we brought for potluck, but Donnie set him straight: they were Yorks, a type the fellow had never eaten. Recently, a friend asked Donnie for his “recipe” for applesauce, so he composed this handy guide. It really isn’t a “recipe” in the ordinary sense of the word, because there is only a single ingredient. It’s more like a journey, from raw to cooked to tummy. Yummy! Barbara and I process and can several bushels of apples each year. If anyone ever eats real honest-to-goodness, home-made applesauce they will never again be satisfied with that yellowish-green gritty pulp that is passed off as applesauce at the store. Apples originated in the Garden of Eden, which, as every schoolboy knows, is located in Kazakstan or thereabouts. They spread far and wide, preferring a cool climate. There have been thousands of named varieties of apples in America alone, but only a few varieties are now commonly available. Unfortunately, people generally buy apples with their eyes, and many tasty but less attractive varieties are hard to find. In fact, we have lost a multitude of varieties to the so-called “demands” of the marketplace. Question: who “demands” watery, tasteless apples with inedibly thick, shiny skins? Apple season generally runs from mid-August through November (this year, because of the heat, apples are finishing earlier – better start your search now!). Varieties ripen at different times in this period so a good sauce-apple in September may not be available in November. We can our apples over three months, enough for the year. You should choose tart apples. Some of the commonly available good sauce-apples are Jonathan, Macintosh, Stamen Winesap, and, my favorite, York. Local Golden Delicious are okay but they tend to be a little chunky when cooked (many like them for pies). Avoid sweet apples such as Red Delicious, Gala and Fuji. You can mix two or more varieties for specific flavors. A delicious combo we hit on last year by chance was a mix of Wolf Rivers and Rusty Coats (Rusty Coats are a variety grown in the Brushy Mountains). If you’re going to can apples, buy at least a peck, or preferably a bushel. It is not cost-effective to buy in supermarkets where they are sold by the pound. A farmers market that sells local produce can be a good place to buy. We’re lucky to live a few miles from the orchard country of southern Virginia so we have a pretty good range of choice. Step 2: Peel, Core and Slice. This is the part that most probably dread but I find it rather pleasant. I just get my apples and equipment, put on some good Bluegrass music and get to work. For equipment, one could get by with a paring knife and a bowl. 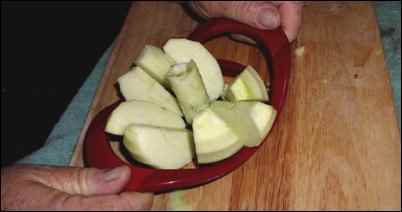 A mechanical apple peeler is a big help to make the job speedier (we bought ours from Lehman’s Non-Electric catalog, the Amish store). 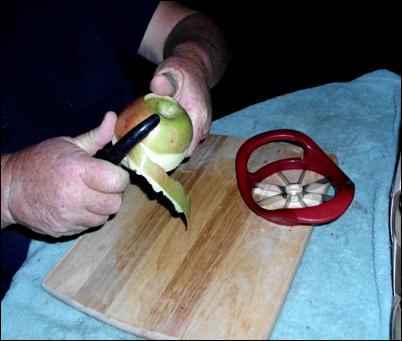 A hand vegetable peeler also works quite well. A corer is a blessing. But, regardless what else one has, a good paring knife is essential. These last three are available in most stores that carry kitchen items. I also use a cutting board, a bowl and a bath towel. I spread a bath towel out on the table and put all of my other items on it. It makes cleaning up the mess much easier. I use the removable bowl from a slow cooker to put the apple slices in. When you have all of this stuff on the table and ready, grab an apple and peel it. Then cut slices off of it down to the core (the corer does this for you). Throw the slices into the bowl. Discard the core and peelings (great for compost!). You can use the peelings to make pectin but you won’t need pectin for this process. If a stray piece of peeling, core or seed make it into the bowl don’t worry about it. If it is eaten, this too will pass. Step 3: Cook The Applesauce. Now, you can do this the easy way or the hard way. The easy way is in a slow cooker or crock-pot. The hard way is all of the other ways, and I’m not going to go into that. If you don’t have a slow cooker, then go buy one. If you can’t afford a new one, go to the Salvation Army Store or Goodwill and you will surely find an inexpensive one. Insert the slow cooker bowl into the cooker. DO NOT ADD WATER. Let me repeat. DO NOT ADD WATER. On most slow cookers one has a choice of low and high. High will cook the apples in two to four hours. Low will cook them in six to eight hours. I generally set mine on low just before I go to bed. The next morning—Voila!—Hot cooked apples for breakfast! Now a very important advisory: when cooking most of the juice settles to bottom, and the juice contains most of the flavor, so stir the pot well. This juice, the natural outcome of cooking, is why you never need to add water. As an aside, someone that lives in the same house as I do used to misappropriate some of the juice. I caught her at it once, and though she tells me that she doesn’t do it anymore, I have my suspicions. You may have noticed that apples are the only ingredient that I have used. I forgot nothing. Most apples prepared this way do not need sugar. I don’t care for spices on my apples so I did not include any. So, after stirring, taste the apples. Be careful: they will be very hot. Let the flavor settle on your soul before you head for the sugar jar or the spice rack. If they need a little sugar or if you like spices, now would be an appropriate time to add. However, if you plan to can them you may wish to wait until you are ready to consume them to add the extras. They will taste even better later, so it’s unlikely they will need enhancement. Here’s a wonderful way to enjoy your hot, freshly cooked apples: crumble buttered toast into a bowl of hot applesauce. Wait a few minutes for it to cool and for the toast to soften from the moisture. Eat. Step 4: Prepare for Canning. Now that you have your applesauce cooked it is time for canning. I do not know why it is not called “jarring.” Do this while your sauce is still hot. Spoilage is caused by air-born microorganisms taking up residence and rapidly begetting in wet organic material such as applesauce. Another component that causes food deterioration is oxygen. The canning process kills microorganisms, restricts oxygen, and places a barrier between the sterile product and the natural environment. Home apple canning is done with a water bath, a pressure cooker or a steam canner. Someone in our family is afraid of pressure cookers, and the hot water bath method requires a lot of water and therefore a lot of electricity to heat the water. The steam canner is the easiest we have found (another purchase inspired by the frugal Amish). Because you are working with hot material you will also need gloves or potholders, tongs, jar lifters, a magnet (pliers will also work) and a ladle. A jar funnel is helpful but not required. All these items can be bought as a set. Math lesson: Canning jars come in quart, pint, and half-pint sizes. A six-quart slow cooker full of raw apples will cook down to about half, so you can get about three quarts or six pints from a six-quart crock-pot. The most our steamer holds is six quart jars; a bath holds seven. Most stores sell jars by the dozen and they generally come with the rings and lids. I like to use the wide-mouth jars because they are easier. One can reuse jars and rings but always use new lids. There is no reason to take a chance on a jar full of sauce spoiling because you tried to save a few cents on lids. A US bushel of apples weighs 48 pounds. A bushel of apples yields about 12 quarts. 5. Prepare/sterilize the jars, lids, and rings. Put water in your canner or steamer. If you’re using a bath put in enough water to cover the upright jars by two or three inches. 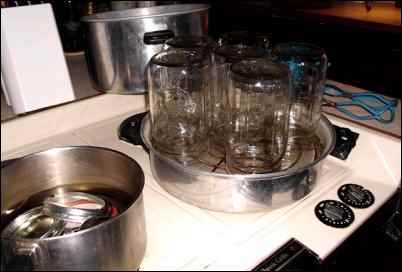 For a steamer, use enough water so that it will not boil away (about three inches, or just up to the gird that the jars will sit on). Place clean jars UPSIDE DOWN in the container. Bring the water to a boil. Adjust the heat so that the water will barely bubble. Remember, you cannot change the boiling point of water by much, but you can speed up the process by using a lid to prevent heat loss, so be sure to use lids. After the water starts boiling, leave the jars in about twenty minutes. While you are waiting on your jars, put the lids and rings in a saucepan covered with water and bring to a gentle simmer. 6. Fill the jars and cook the applesauce. Now, your sauce jars lids and rings are very very hot; it is time for the coup de grace. Before you start, be warned that everything is HOT and hot stuff can hurt you. WEAR YOUR GLOVES! Take the lid off your steamer or bath with the opening away from you so that you don’t get a face full of steam. Remove one jar. If you are using a water bath canner you may need the jar lifter for this. For a steamer, gloves will sufficient. Set the jar upright near your well-stirred applesauce. If you have a jar funnel place it in the jar. Ladle the hot applesauce from the crock-pot into the jar. Fill to about one-half inch from top. You can shake the jar a little to settle the sauce so you can get more in it. Now remove a lid and ring from the boiling water in saucepan. Tongs, magnet or pliers are useful for this. Again, WEAR YOUR GLOVES. With a cloth or paper towel, wipe the rim of the jar to make sure that it is clean. Place the lid rubber side down on the jar. Take the ring and turn it granny-hand tight, not mechanic-hand super-tight. Repeat this process until you are out of applesauce. If your last jar is only partially full, just refrigerate it for eating soon. Put the full, lidded jars RIGHT SIDE UP back in the canner or steamer – use the jar lifters or WEAR YOUR GLOVES. You may need to replenish the water since some of it will have boiled away in the first, sterilizing, process. Bring the water to a boil for half an hour. Turn off the stove, remove the jars and set them on a dishtowel on the counter to drip and cool off. After a while you will hear the lids pop. This is the weight of the atmosphere pushing down on the lids, thereby sealing the jars. When the jars have cooled to room temperature, push down on the center of each lid with your finger. If it does not move, your jar is sealed. However, if the lid goes down and springs back with a pop, that jar is not sealed. You can re-process using a new lid or just set it in the refrigerator for eating. If you want to, you can now remove the rings. Back when money was tight and people did a lot of canning they would only buy a few rings and use the same ones over and over all season long. However, when you open a jar of applesauce, if you do not consume the entire amount, you’ll need the ring for storing the unused portion in the fridge. WARNING: The hot bath and steamer canning methods are acceptable for apples, peaches, tomatoes and other fruits with a high acid content. THESE METHODS ARE NOT ACCEPTABLE FOR LOW ACID FOODS SUCH AS BEANS, SQUASH AND MOST VEGETABLES. LOW ACID FOOD CANNED BY THE HOT WATER BATH OR STEAMER METHOD CAN CAUSE SICKNESS OR DEATH. Our grandchildren love our applesauce, and expect us to bring them a jar when we visit. Last year we taught two of them, at their request, the secrets of making it, and they got to eat the results. Note also: a quart or two of applesauce is a great potluck contribution or house gift. Last year we put applesauce in decorative pint jars with red and white lids and gave them out for Christmas. Apples are another of Mother Nature’s gifts that keep on giving. From the cool days of fall to the dead of winter, and all the way through the summer (if you “put up” enough jars) you can have hot applesauce for breakfast (Donnie’s fave) and cold applesauce on the supper plate as a condiment (that’s what I like best – soooo good with cornbread). I Have just finished filling my crockpot full of apples I can’t wait to try this in the morning. 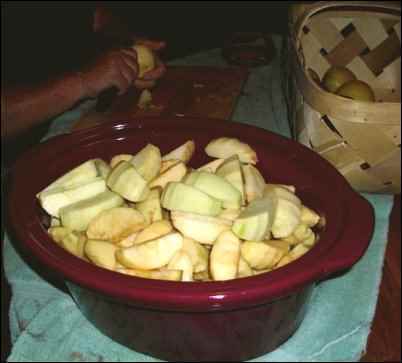 I Have just finished filling my crockpot full of apples I can’t wait to try this in the morning. Thank you so much for sharing.